If you update the stairs leading up to your front door, it’s amazing how much of a statement you can make. To beef up the entrance without building a whole new porch, consider a tiered stair design like this one in Boston to give your entrance more presence. A new railing at the front of your house can really transform its look. Choose a style that reflects your taste. 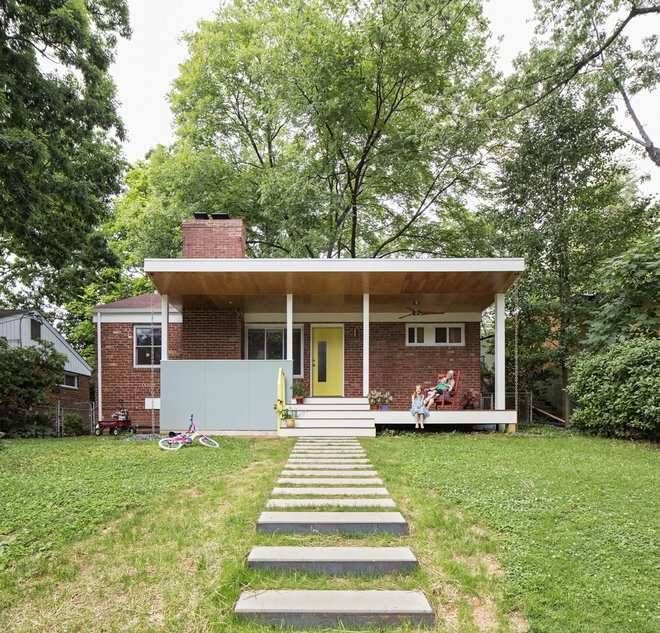 It doesn’t necessarily have to match the style of your house, as eclectic-style homes are the norm these days. Besides, none of us is truly 100 percent one type of style. 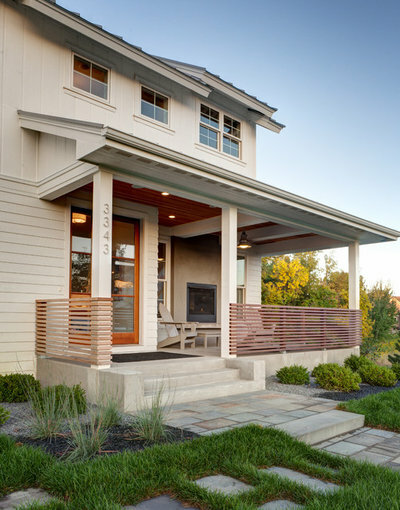 By adding a stylish overhang above your front door, not only are you adding something functional to shield you from the sun and rain, you are adding character to the front of your house. 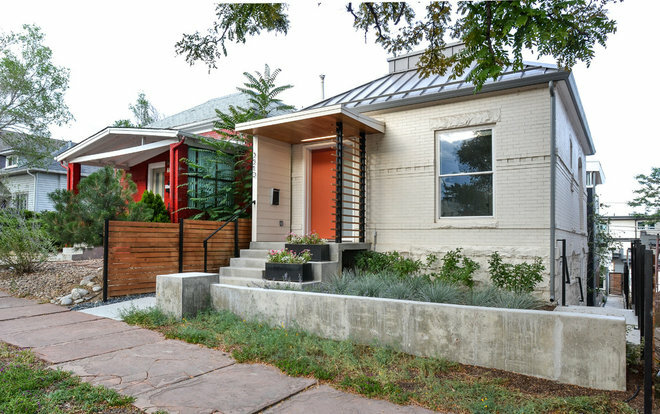 Get creative with your overhang and incorporate some architectural screens like this home in Denver. 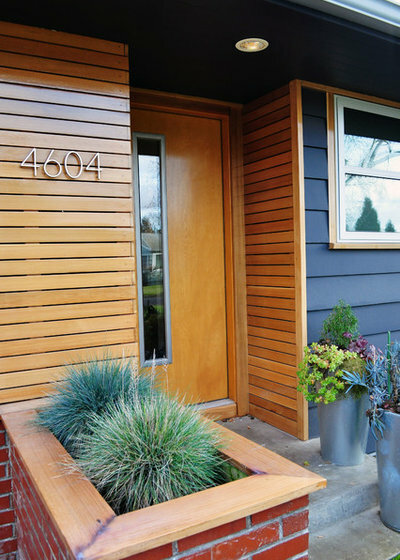 Covering your house in a new veneer and siding can breathe fresh life into your exterior. 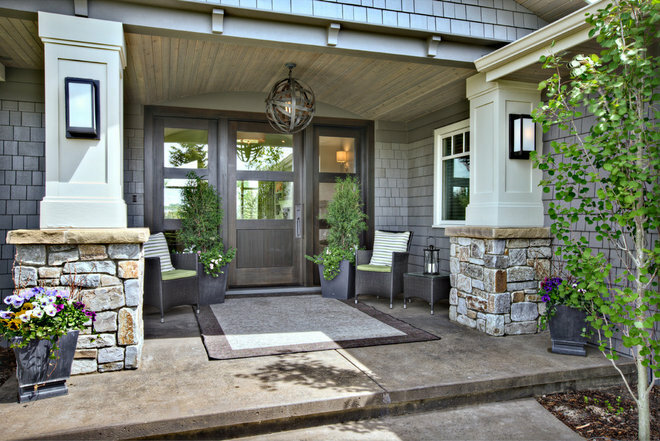 You can layer on brick or stone veneer to bring substance to the front of your home. 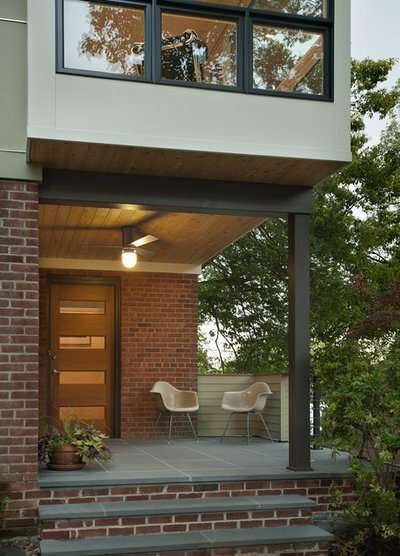 Also, consider the underside of your overhang — adding tongue and groove cedar can raise your front porch to a new level. You don’t need to spend a fortune on all new landscaping. Start with an interesting walkway to your house and slowly work on the surrounding landscape to get it to where you want it to be. 6. Soft and hard landscaping. 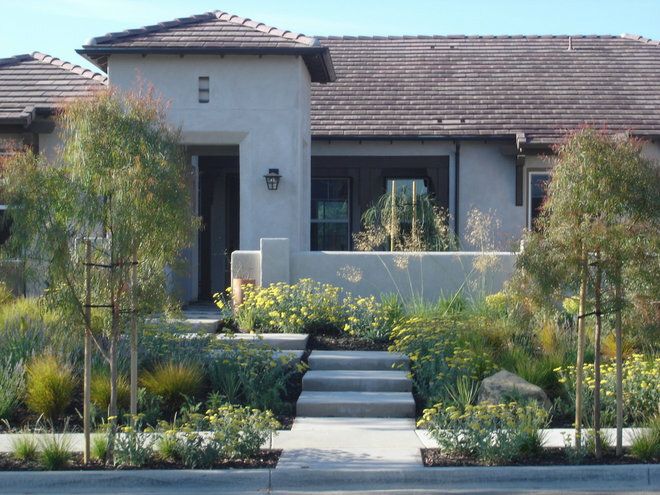 If you want to take on a bigger project, adding soft and hard landscaping is one of the most effective ways to transform the front of your home. It’s best if you work with a landscape designer to come up with a cohesive plan for your walkway, stairs, plants and flowers. This takes some planning and it can be costly, but it’s satisfying to witness the transformation. 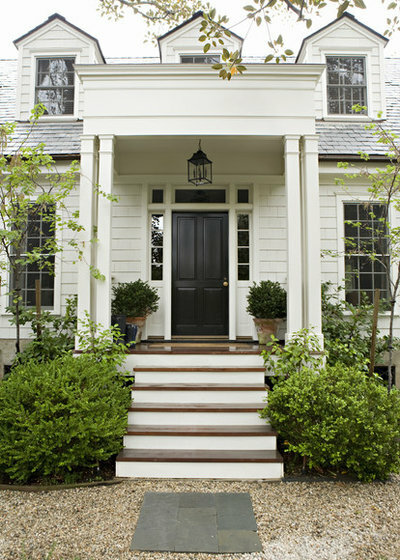 A simple paint job for the front of your home can work wonders. There are a lot of computer programs that let you see the exterior of your house in various color combinations. Find the combo you love most and go for it. If you grow tired of it, you can always change it. 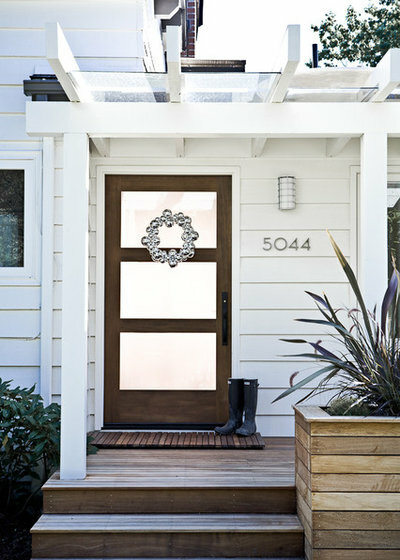 Adding new house numbers is a simple way to make an instant impact on the exterior of your home. Besides just picking out new numbers, consider where they will work and look the best. It might be a different location than your current house numbers. 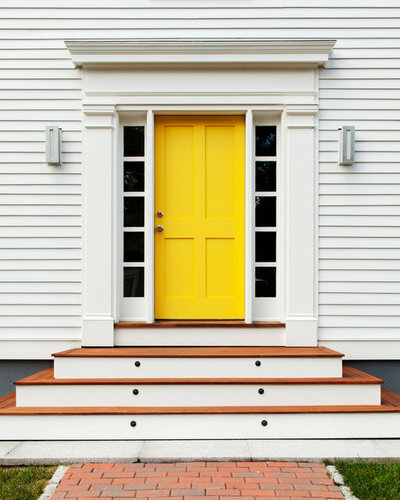 If your budget lets you update just one thing at a time, you may want to start with your front door. Consider choosing something that lets light into the interior of your house. That serves dual purposes, by changing the feel of the outside of your home and altering the inside too. It’s amazing how much lighting can transform a space, even on the outside. Consider wall sconces, overhead lighting and path lights for maximum impact.